Three mornings a week, employees at Chunghwa Telecom's Taipei office in Taiwan put work on hold. Once the music kicks in, everyone rises from their cubicles and begins moving to rap lyrics which say: "Exercise every day, morning and night. Health is something you cannot buy." After 15 minutes, some head straight to rinse the sweat off their faces, jokingly suggesting the company should provide shower facilities. This is not a communist work unit but democratic Taiwan, where in the past two years the government has spearheaded an ambitious, nationwide programme to help the population lose weight. The programme has been well-received and is showing some initial success. In the past two years, around 1.5m people have signed up and they have lost a combined 2.2m kg of weight - far exceeding the government target. Unlike US First Lady Michelle Obama's campaign focusing only on children, Taiwan's programme targets all of society. What is driving it is the belief that being overweight is not just a personal matter, but a national issue. "Half of adult men and a third of adult women are overweight or obese. Eight out of the 10 leading causes of death in Taiwan are associated with obesity," said Shu-Ti Chiu, director-general of the government's Bureau of Health Promotion, which leads the effort. "The government in Taiwan recognised the importance of this issue, so we set a target of losing 600,000 kg in one year and then we mobilised the whole society to do it together." Compared to other Asian countries, Taiwan has a higher percentage of people who are obese - 44% of adults. And its proportion of overweight children - a quarter - exceeds that of Australia, Germany, New Zealand and the UK, officials say. An increasingly sugary and fatty diet and insufficient exercise are to blame. Fried chicken patties, greasy sausages and even fried vegetables are popular staples. Many people do not bother cooking - they buy from the food stalls found on almost every street. Hectic and physically inactive lifestyles that involve working extra jobs or attending extra classes after school are also exacerbating the problem. The obesity epidemic is straining the already cash-strapped national health insurance system. 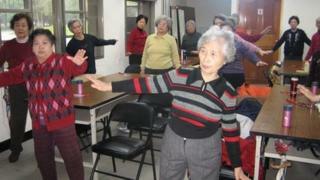 About 10% of total healthcare spending in Taiwan goes to treat problems related to obesity, according to experts. So the government decided it was time to slim down - starting with President Ma Ying-jeou, who set an example by losing 11kg (24lb; one stone 10lb). Mayors and county magistrates also joined in; most of them were overweight. Key to making the programme work is people's willingness to accept others' concern about their weight. One of the participants, Chen Bai-mei, said she had gained a lot of weight after having children and tried dieting without success. Without good health, how can employees do their jobs well? "I was going to give up, and just let myself be heavy, but then my colleagues all said I had gotten fat," said Ms Chen. Now she has lost weight and her blood pressure has returned to normal. Local government efforts have also boosted participation in the programme, through fliers posted on the streets and classes at community centres. The campaign even has a catchy slogan which rhymes in Mandarin and roughly translates as: "Eat Wisely. Exercise Happily. Weigh Yourself Daily." Participants are given simple nutritional advice - which can come as news to some who had been misled by the onslaught of advertisements and misinformation about weight loss methods. "I used to exercise too, but couldn't lose weight because I still ate too much. Now I've gotten into the habit of calculating my calorie intake, and it's no longer hard to lose weight even if I only do simple exercises like speed walking," said 64-year-old Shih Hsi-hsien, who has lost 14kg in six months. The theory is that it is easier to lose weight as a collective effort. "Doing it in a group is helpful because everyone sees everyone else's results. If I do it alone, it's hard, especially when you see your family members eat like mad," said Ms Chen. That is especially true in companies. After all, it is a lot more difficult to snack after eating a full lunch if all your colleagues know you shouldn't be doing it. And it is easier to lobby for the cafeteria to serve healthier food if everyone complains. Companies' human resources departments have designed exercise outings and team competitions, awarding prizes including gym membership and travel vouchers, to people who achieve their ideal weight. Food in some company cafeterias have been marked red for high-calorie, yellow for medium and green for healthy. Chunghwa Telecom is one of several firms that have made exercising a part of the company culture. In its Taipei area offices alone, more than 1,500 workers have signed up. The company has set up fitness rooms with exercise machines and ping pong tables. Managers have led the way by climbing stairs instead of taking lifts. "We believe having healthy employees is the key to having a successful company. Without good health, how can employees do their jobs well?" said manager Lin Maw-cherng. Despite the initial results, experts caution that while some have lost weight under the programme, they may gain it back. The benchmark of success is whether or not Taiwan's proportion of overweight people drops in the long run. The programme is also meeting with some resistance. Some parents have refused to let overweight kids be taken out of class for more exercise, saying they should focus on studying. "Many parents have the wrong thinking that chubby kids are healthy kids," said Yeh Chih-chien, principal of Gengliao Elementary School in New Taipei City. And so far, the number of participants is still small compared to the percentage of the population that is overweight. But officials plan to continue this programme year after year and convince more people to sign up. They have advocates in people like Mr Shih. "My heart used to feel like it would stop when I climbed the stairs to my apartment. I was always worried I would have a heart attack," he said. "Now I can jog 5km (three miles) non-stop with no problems. By losing weight, I feel healthier and that I have many years ahead of me."